ISBN: 09774288-9-3. A companion book-on-CD-ROM to Sweethearts, written by Sharon Rich, with 160 photos including 100 high resolution candids! 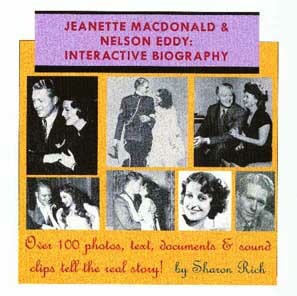 Written in Q&A format, it presents the evidence backing up the Mac/Eddy relationship, drawing on photos, documents, sound clips and interview clips including Nelson speaking about his temper! Plus complete filmography with photos from each film and a high-resolution portrait gallery! “Better than a Movie of the Week!”–reader review. A computer with Acrobat Reader(included on CD) needed.